DELISLE -Carte Du Diocese de Narbonne. . .
DELISLE, G - Carte Du Diocese de Narbonne. . . 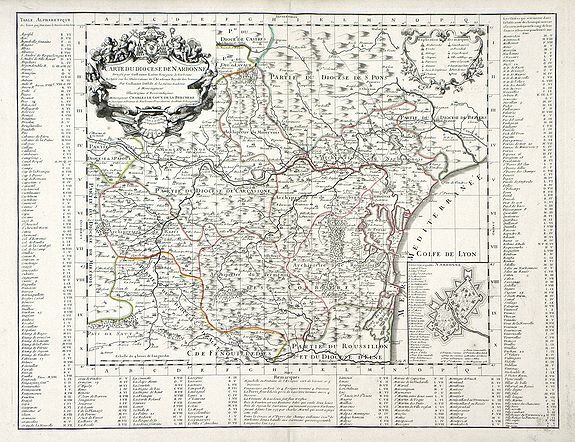 Title : Carte Du Diocese de Narbonne. . .. Description :Finely detailed map of the Diocese of Narbonne, a Catholic Diocese that existed in southwestern France until the French Revolution, by Guillaume de L'Isle. A nice inset map of the city of Narbonne is at the lower right, and a table of locations runs along the right, bottom and left edge of the map. A pretty title cartouche featuring a coat of arms is in the top left corner. Guillaume de L' Isle was the leading French cartographer of the early 18th century. He was known for both his strong belief in the importance of accuracy, as well as his prolific output of over 100 maps during his lifetime. Guillaume de L'Isle was born into a family of French cartographers, and was the pupil of mathematician and astronomer Jean Dominique Cassini. It is said that de L'Isle drew his first map at the age of nine. His first atlas, which he published at the age of 25, made an unprecedented effort to both correct fallacies of earlier maps, such as the depiction of California as an Island, and to add current data to maps. De'Isle was elected to the French Academie Royale des Sciences at the age of 27 and was later appointed to the highest honor as Premier Geographe du Roi (1718). His critical approach to the maps of his predecessors, backed by his training under J. D. Cassini, earned him recognition as the first scientific cartographer and the foremost geographer of his age. Condition : Some discoloration along paper edges; small paper loss at bottom left corner and along to top right edge; some minor losses along left edge where the sheet was bound. Area of faint ink smudging in bottom right corner. The number “28” appears in ink in the top right corner.